In what right world does Kristen Stewart beat Charlize Theron? Oh yeah, the make-believe, never-gonna-happen, fairytale kind of world. The two team up in this years (over played) Snow White and the Huntsman, and director Rupert Sanders (mostly known for commercials) spins a very dark and gothic take on the classic fairytale. And while the scenery in this film is magnificent in scale, added cleaver special effects, the movie drags and tends to tire quickly in its disappointing second half. The film's most exciting draw is the evil, menacing, Queen Ravenna (Charlize Theron). Thorone definitely tears it up, offering a suitably maniacal portrayal of a woman who sees her outer beauty as a source of great power. Bathing in white liquid and crawling out of a pit of black tar are two of the film’s most striking visions. And speaking of visions, each and every costume she wore was breathtaking. While I don't see this movie takin g home the Oscar for Best Picture, I can definitely see it winning for Best Costume Design. The film also gives us a peak into Queen Revenna's past, revealing why she has become so wicked, which I didn't particularly care for. We should loath the evil Queen, not feel sorry for her. 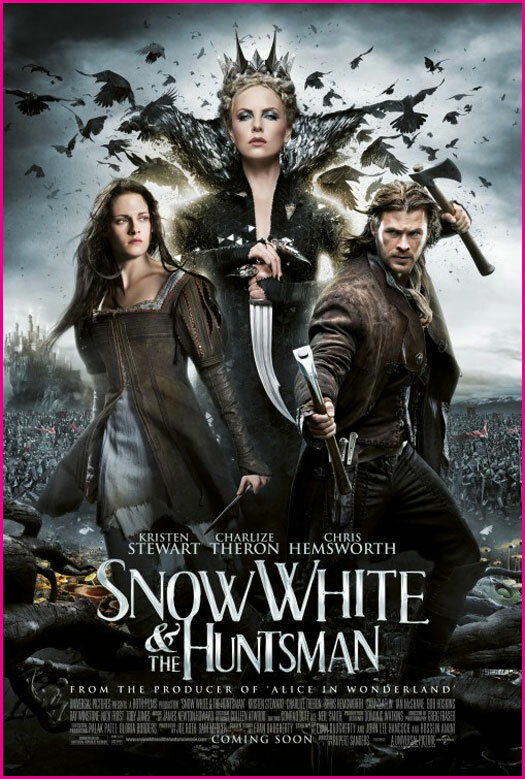 As for Snow White (Kristen Stewart), she’s been beautifully reinvented as both majestic maiden and fierce warrior. However, to pull this type of strong heroinism off it requires a confident, well-grounded portrayal. Obviously Stewart’s characteristics fail completely (duh). Sadly, Snow White too often resembles the ever-pouting, overwhelmed, one-note Bella Swan. 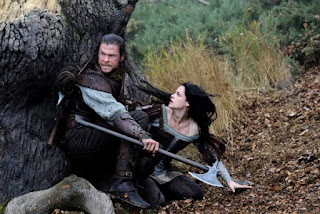 While there was some chemistry between Snow and the Huntsman (Chris Hemsworth), there was absolutely no chemistry between Snow and her prince (Sam Claflin), which was disappointing. But the real problem, ultimately, lies in the story arc, which requires a "Joan of Arc" type transformation from its heroine - one that Stewart could not make happen. The film spirals from intriguing to (semi) action packed and many of the characters and story-lines – especially the dwarf's – are left malnourished and forgotten. The real heroine in this fairytale is Theron - she is the only one who fully captivates the audience throughout the entire film.